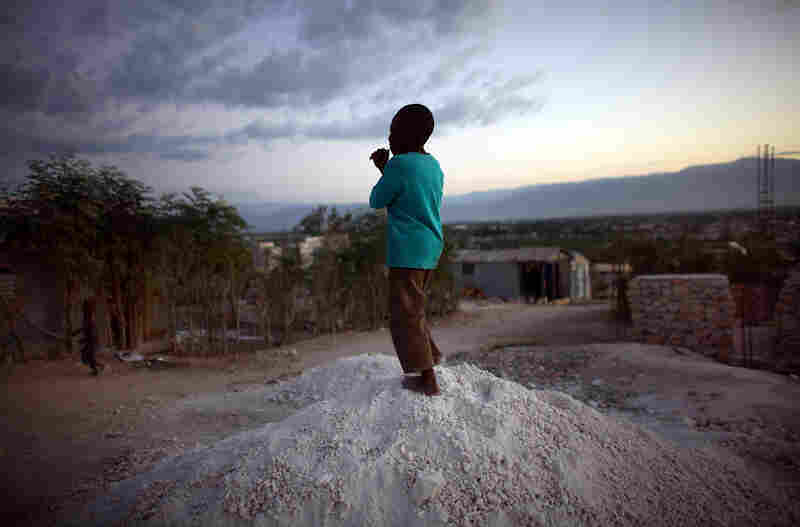 A boy stands on a pile of rocks used for the construction of new homes in the hills overlooking Camp Corail, just north of Port-au-Prince. Squatters are streaming into the area and setting up communities, with little government oversight. 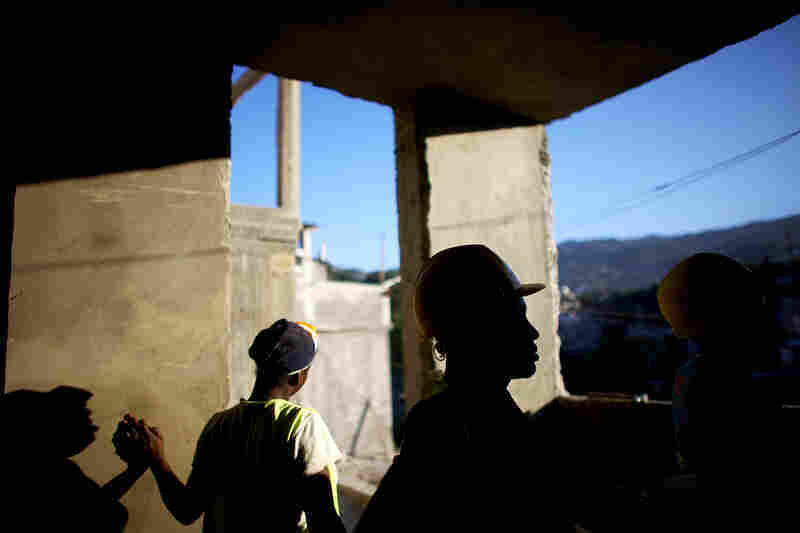 Construction workers overlook the hills above Port-au-Prince near Petionville, where an 18-unit complex is slated to go up this year. Despite billions of dollars in international donations for earthquake relief, only about 5,000 permanent houses have been built. The 16/6 project, funded by the Haitian government, was initially intended to allow the closure of six relocation camps and return nearly 5,000 families to 16 neighborhoods. But construction has been extremely slow in the three years following the devastating earthquake. Rose Lermonis spent months living in what she described as an "awful" camp in Petionville. A rental subsidy program helped her move out, but she ended up homeless again when the money ran out. She now lives in a room owned by her sister. 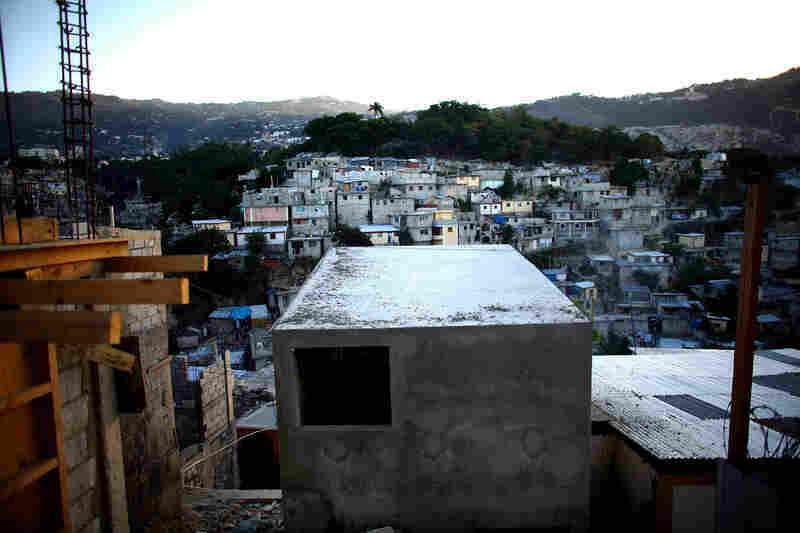 The La Piste camp in Port-au-Prince held 50,000 residents at one point. Some people have left, but the camp is still overcrowded. Residents say they have few options for work. 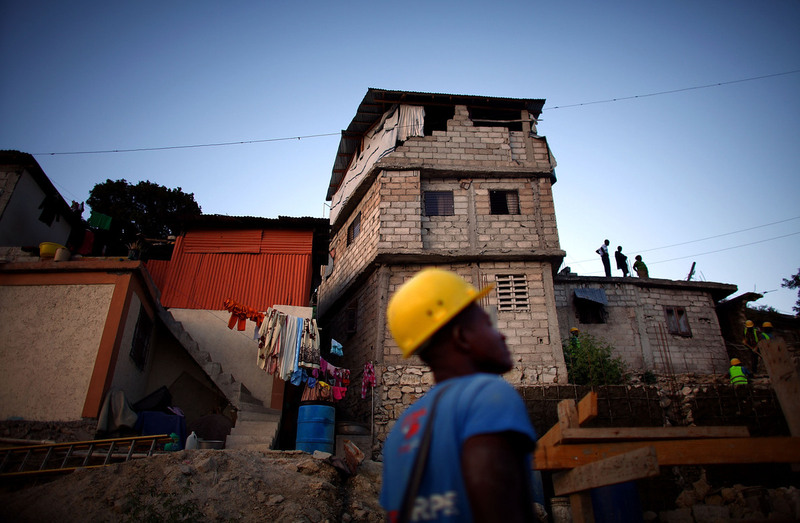 Workers finish the cement walls on a multilevel building in the hills above Port-au-Prince near Petionville. They plan to finish the 18-unit housing facility in 2013. 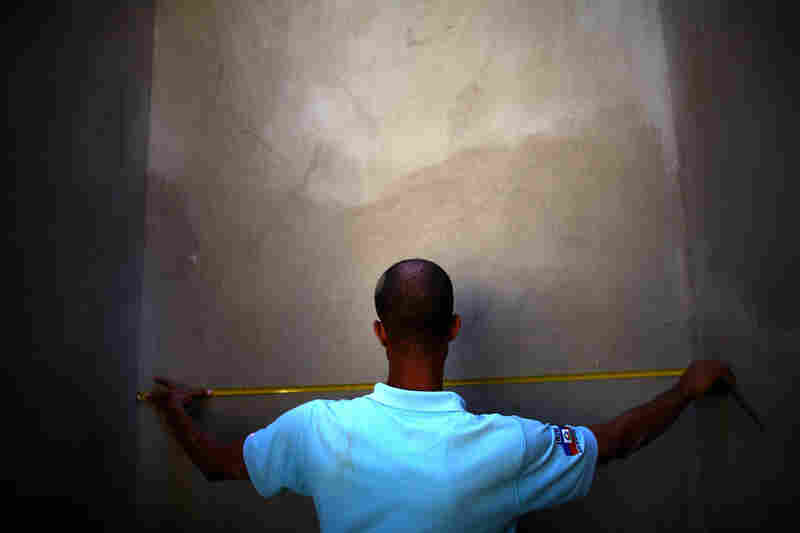 A man measures a completed section of a retaining wall at a construction site in the hills above Port-au-Prince near Petionville. 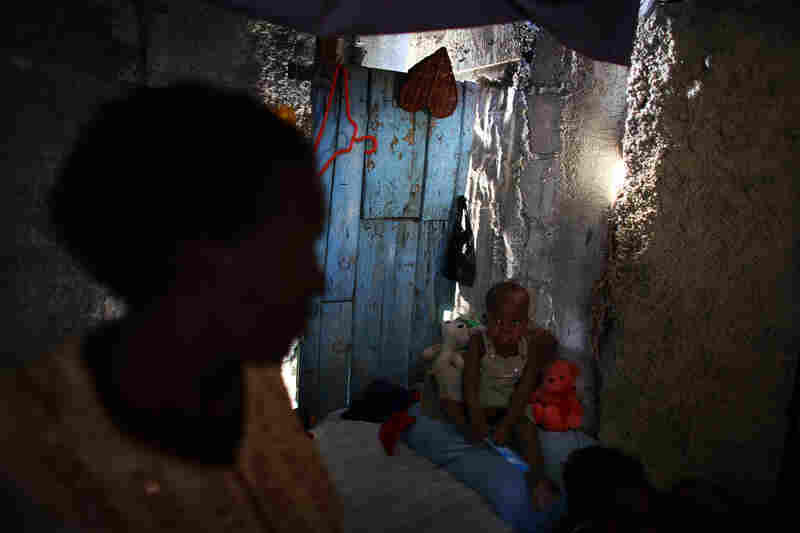 Bibeta Louissaint (left) stands in her makeshift shack with her 2-year-old son, Sebastian, in the Fort National neighborhood of Port-au-Prince. This area was home to many people living in the camps around the national palace. Louissaint received a rental subsidy last year to move. 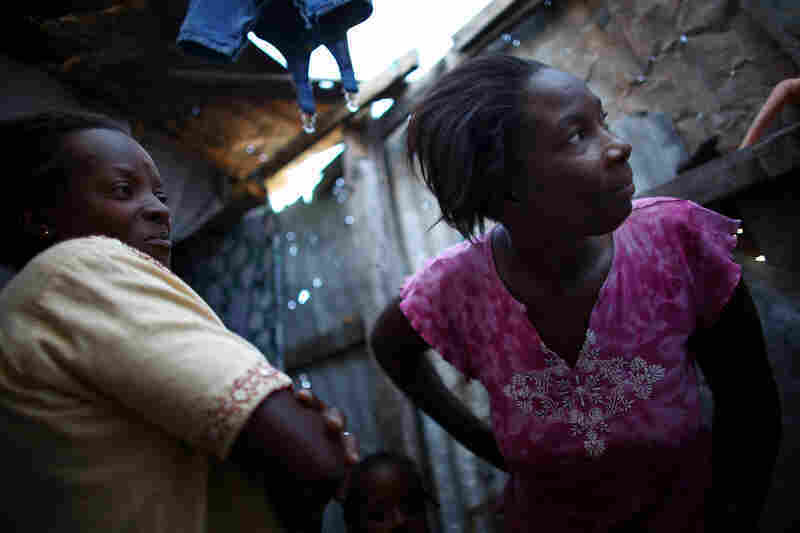 Bibeta Louissaint (left) and Beatrice Rochelain are neighbors in the Fort National neighborhood in Port-au-Prince. Many people who received cash and subsidies to move out of the camps have returned to the area. 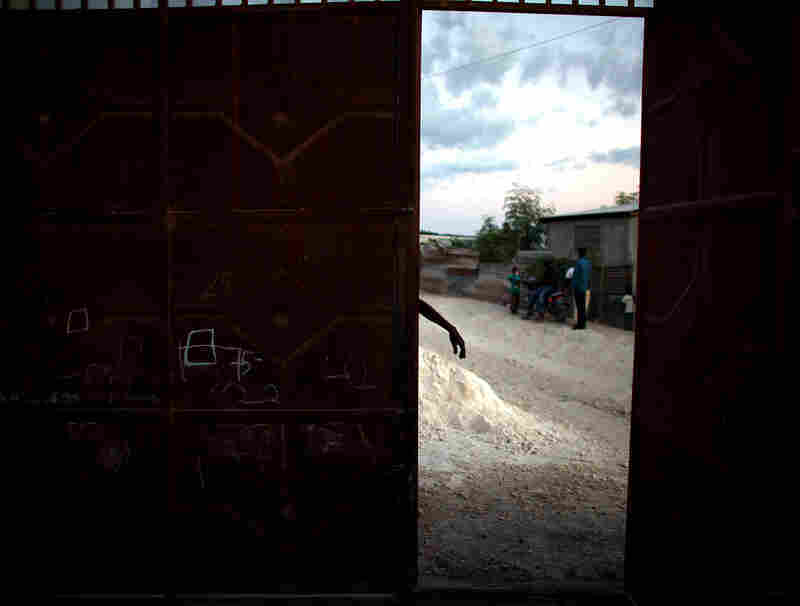 A man works on his steel gate outside of his ramshackle house near Camp Corail, just north of Port-au-Prince. There's been an epidemic of sexual assaults on women living in the camps. And residents complain that unsanitary conditions and numerous cooking fires in the cramped quarters have caused respiratory problems among the children. Jacqueline Syra has been living in the La Piste camp for three years. She says she has no idea when she will be able to leave. Fears, however, that cholera would spread rapidly through the overcrowded settlements never materialized. Aid workers say this was probably because of the treated water distributed in the camps. When the earthquake struck in January 2010, Jacqueline Syra was nine months pregnant with her third child. 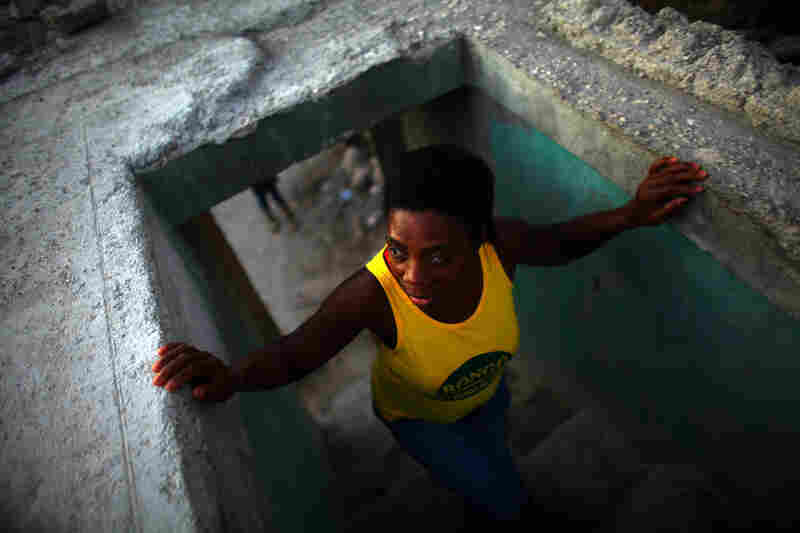 Her house near the sprawling slum of Cite Soleil collapsed, she says, killing her husband. Syra, along with tens of thousands of other people, moved on to an abandoned military airport known as La Piste. Syra never expected that three years later, she'd still be living on the runway. "We are not living well in the tents," she says. "Sometimes men get in here and attack me or rob my things." Her shack is a patchwork of fraying tarps that are tied together with blankets and strung over a skeleton of mismatched sticks. Two motorcycle tires on the roof keep the cloth from flapping in the wind. She uses the front of an old portable toilet as the door to her shelter. There's no electricity, and she cooks on the dirt floor. Syra shares this shelter with her three children. "I don't sleep well, I don't eat well," says the rail-thin, 49-year-old mother. "I was a fat woman, and look at me now. I lost a lot of weight because I cannot sleep or eat well here." This flimsy three-story house, which was rebuilt after the earthquake in January 2010, will have to be demolished to make way for an 18-unit housing project. Many homes that were rebuilt after the quake are even more dangerous than the original ones. At its peak in 2010, this camp held roughly 50,000 residents, according to humanitarian officials. La Piste is less crowded now, but there are still tens of thousands of people here. Women bathe naked with buckets at the public water taps. Kids scurry along trash-filled ditches. "I don't know when I'll leave," Syra says. "I don't know how long I'm going to be here." After the quake, international aid agencies were busy keeping people alive, says United Nations spokesman George Ngwa. They provided Haitians with basic tarps for shelter, removed most of the rubble, paved roads and, yes, even built some housing. "I do understand those who think that there isn't much to show for all that has happened since 2010, but there is a lot that has happened," he says. 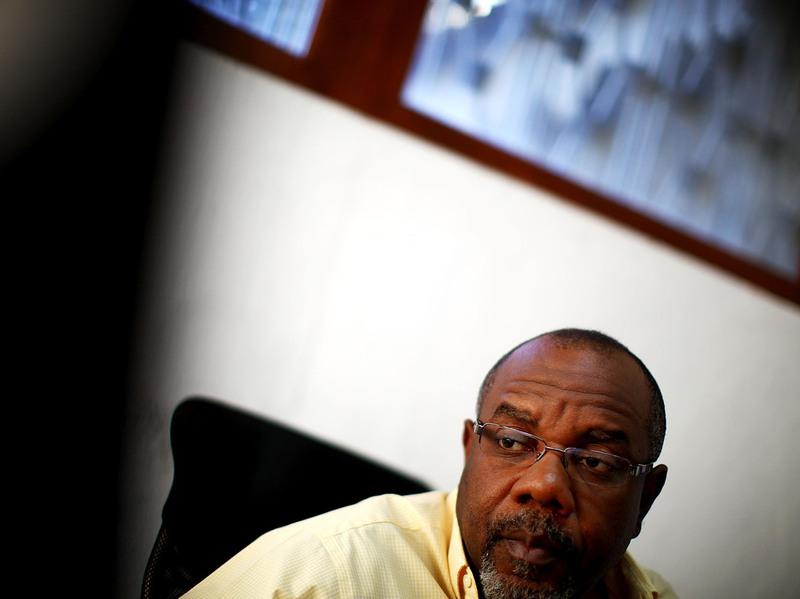 Clement Belizaire directs relocation and rehabilitation in Haiti's reconstruction program. But Ngwa, who works at the UN's Office for the Coordination of Humanitarian Affairs in Haiti, does admit that some mistakes were made in the rush. For example, "new houses were built in areas that had no sustainability in terms of jobs for the people who were supposed to move there," he explains. 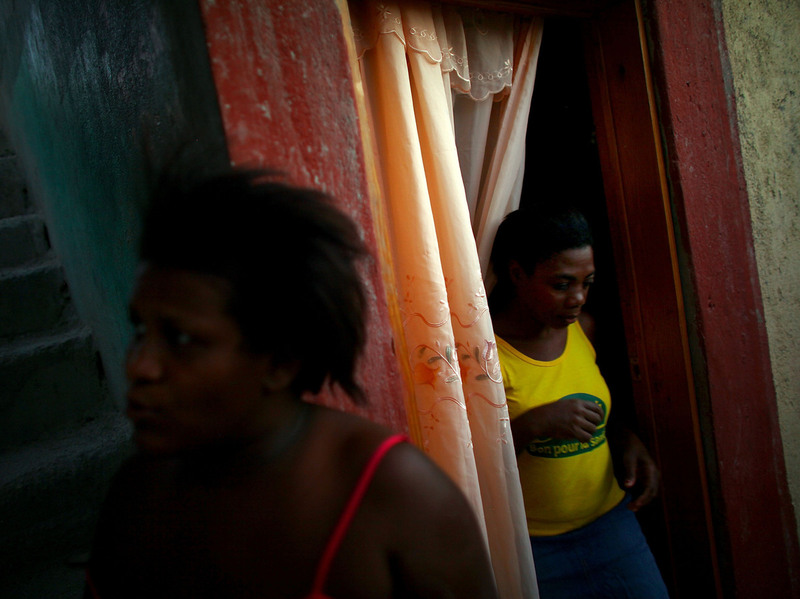 "So some of them abandoned the new houses, and they're back in the camps." Immediately after the quake, billions of dollars were pledged by international donors to help Haitians recover. Despite this, only about 5,000 units of permanent housing have been built. The grand plans to "build back better" have evaporated. Instead, President Michel Martelly launched a program aimed at getting people to leave the camps. The government offered them a rental subsidy of $500 and $150 in cash to anyone willing to vacate several public parks; 100 percent of the residents in all of the targeted camps agreed to the deal and moved out. "The overall budget for this program was $78 million," Clement Belizaire, who directs the relocation and rehabilitation in the government's reconstruction program, tells Shots. He says his office initially focused on trying to repair the damaged houses of camp residents. But this only affected about 10 percent of the camp population, he says, and only temporarily. "So after a while, that 10 percent is replaced, the camp fills back up. So we came [up] with a rental subsidy," he explains. "That's only when we started to see camps that were cleared completely." 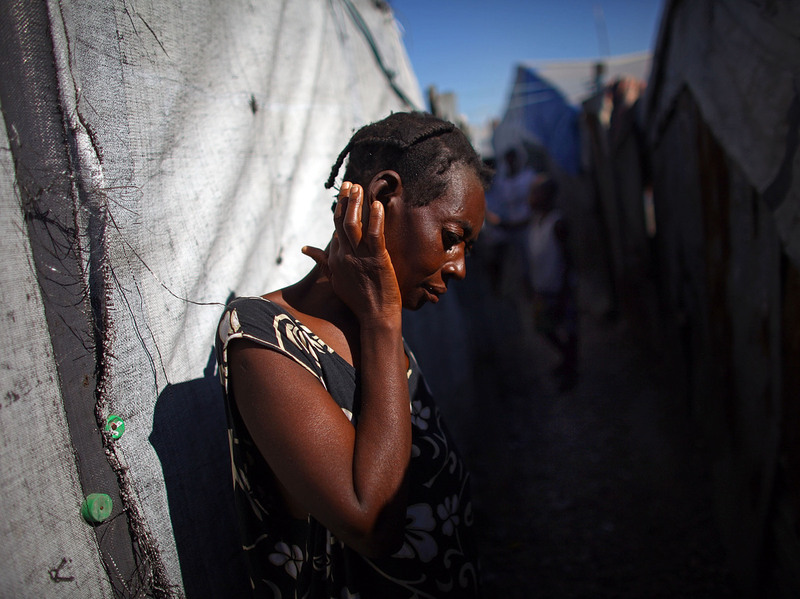 Rose Lermonis spent months living in what she calls an "awful" camp in Petionville, a suburb of Port-au-Prince. A rental subsidy program helped her to move out temporarily. 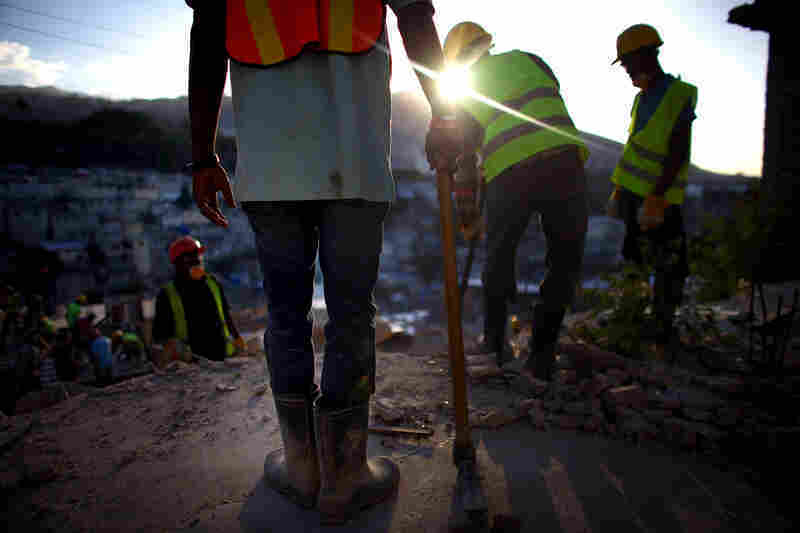 His program is also involved in building several dozen new houses and rehabilitating destroyed public infrastructure — roads, electricity lines and sewers — in neighborhoods that are receiving thousands of the former camp residents. Rose Lermonis, who moved with her family into a tarp-covered shack in a public park after the earthquake, should be one of the success stories of Belizaire's resettlement program. The 52-year-old mother spent more than a year in what she says were terrible and terrifying conditions in the camp. Then in November 2011, she got a subsidy to rent a small cinder block hut. But once that money was gone, she could no longer pay the rent and had to move with her children to a room owned by her sister. "You see, all the people who used to be in the tents are still living in misery, because they don't have jobs," she says. "If they don't have a child or someone to support them, they have nothing." 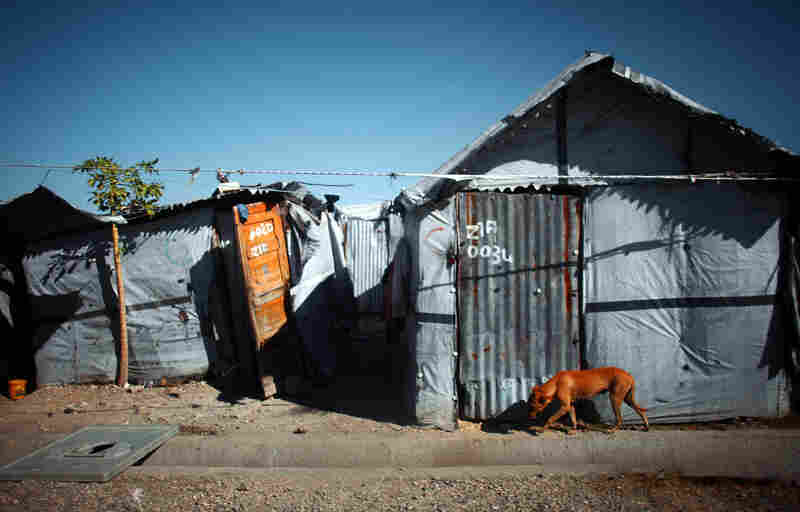 Before the earthquake, Haiti was the poorest country in the Western Hemisphere. As it moves on from the disaster, the nation is still burdened with all the problems it had before its capital was destroyed.